The current Modern climate discourages players from playing fair more than any other Modern climate in recent memory. Ever since the unbanning of our old pals Jace, the Mind Sculptor and Bloodbraid Elf, the format has gotten faster and more linear with each passing day. People trying to beat the established archetypes have flocked to decks that they thought could get the job done a turn sooner, or were somehow harder to interact with. As such, we have seen many fair interactive decks struggle, but Mardu Pyromancer seems to still stand out through all of this. Maybe I’m cheating a bit here—Mardu is definitely a fair deck, no way around that. That said, the archetype does support maindeck Blood Moon. This will occasionally score you some “free wins,” in true combo-deck fashion. The finer details are obviously different, but the result is the same. Some opponents will just fold to the card game one due to their entire lack of an ability to interact with it, and they will need to find an answer in the sideboarded games. This ability to support a game-winning card in matchups that would otherwise likely be quite a struggle, is a big reason why I think this deck is better than its other fair brothers and sisters at the moment. Some decks in Modern will be difficult to interact with on a consistent basis; the deck will still have some things to say in most of these matchups, but many of your cards will be dead. Blood Moon tells your opponent it’s time to pump the breaks a bit, and often gives you the time you need to interact in the few ways that you are capable of doing so. Often it just gives you the time you need to close out that game with your angry army of Elementals. 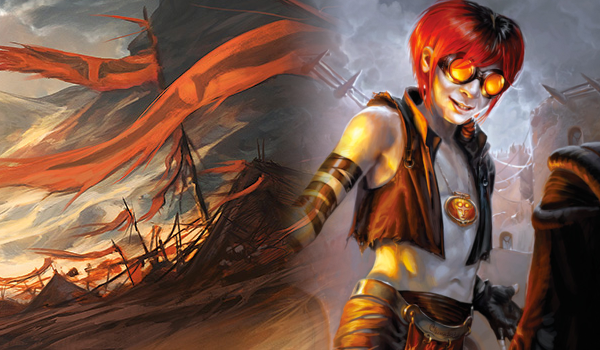 People have tried Blood Moon in other fair midrange decks before—namely Jund—but it has never been quite as smooth. There are a couple reasons why I think it pales a bit in comparison, but the most relevant in my eyes is the presence of Faithless Looting in Mardu. One of the best cards in the format, Faithless Looting solves nearly all problems. I will almost never mulligan a hand with a red source and a Looting, and I can’t count the number of times I’ve said, “Well if I just draw a Looting here…” It lets you discard those Lingering Souls that you couldn’t cast anyway and sets up well for your Bedlam Reveler. It keeps you from flooding out when you flash it back in the late game. It does everything! Certainly, it is the linchpin that holds the deck together. There was a time when I did not think very highly of this deck—but no longer! In this metagame, I think Mardu is a contender with some of the other pillars of the format like Humans and Hollow One. I’ll be heavily considering this deck for upcoming events and would encourage you to do the same if the archetype interests you. I hope you enjoy the matches and, as usual, I’m interested to hear what kind of content you’d like to see moving forward, so I can continue to evolve and improve my videos, so let me know! If you’d like to see similar content, check out my Twitch channel for some more live Modern. In game 1 of the match against Tron, I believe you missed a chance to win on turn 10. Swing with everything; after blockers are declared Kommand to Shatter the Wurmcoil and Shock the face; get through for at least 4 damage no matter how the opponent blocked; then Bolt for the last 3 points of damage. Previous comment should have said turn 9, not turn 10: the turn before the opponent played their second Karn, when you had Reveler, Pyromancer and 4 tokens on the board. Yeah you’re right, looks like I missed it. With 1 card in my opponents hand I think there is no reason not to just go for it there. Nice catch!